Protect Against UV Light and Welding Sparks with Goff’s Welding Safety Curtains! 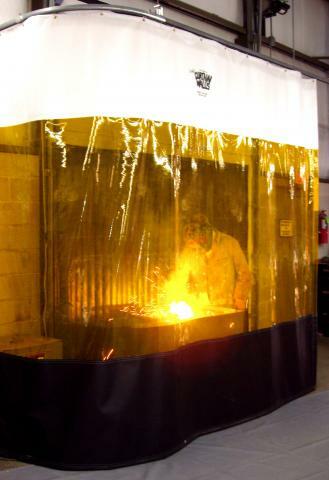 Goff’s Welding Curtains create a retractable barrier to contain welding fumes and contaminants. Weld Curtains also block 100% of U.V. light providing a safety wall that can slide in and out of use as necessary. Custom made for each application, Goff’s weld curtains increase productivity, reduce injuries, and improve work environments! Safely Protects personnel on other side from welding sparks and UV Light. Double Lock Stitching with mildew/rot resistant thread. Capital Equipment and Handling, Inc.
Goff’s Welding Curtain Packages Come Complete with Mounting Hardware! Included: End Mounts, Universal Splices (for flush or suspend mounting), 16 gauge galvanized steel track pieces and nylon roller hooks. 90 degree curves and other mounting hardware are also available. To view additional information about the accessories click here! Personalize your curtain with your custom company logo! Prices based on size, color, & quantity. Goff’s Filter Panels allow air flow between areas and help alleviate negative pressure in work areas. Avaliable in 2’x4 or 4’x4′ sizes, filter panels come standard with hook & loop fasteners around the edges for easy replacement. Goff’s offers a 6″ floor sweep custom made to match each curtain to block dirt & dust from sliding underneath the curtain. Sewn on or attached with velcro for easily replacement! Goff’s Valence Panels are custom made in any dimension to create a permenant barrier above a curtain wall. Valences can be equipped with velcro or grommets for mounting. Goff’s 3′ x 7′ Walk Through Strip Door is built into the curtain for easy access from one side to the other. The strip door is attached to the curtain with velcro for easy replacement. Goff’s offers 2 styles of wind ties to help keep curtains from in place in windy situations. Style A wind ties are designed for interior use and feature a velcro type attachment. Style C wind ties are designed for exterior use and feature a spring clip attachment. Goff’s Curtain Walls are custom made in heights up to 100′ and in any width and layout. Top & Bottom Vinyl Colors options include: blue, white, forest green, yellow, red, gray, purple, maroon, beige, black, orange, and field green.